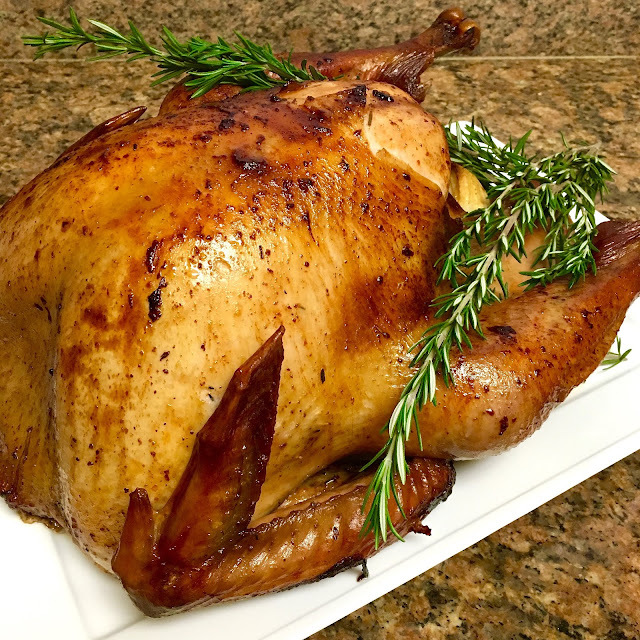 The key to an extra moist, tender and flavorful turkey is to brine it before you roast it. This extra step will totally change your poultry game, and couldn't be more simple! 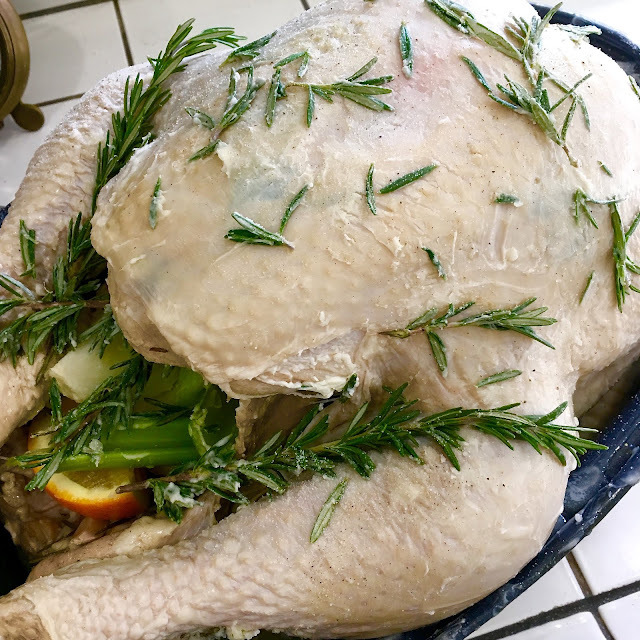 By letting the turkey sit, submerged in a brine, it will be able to absorb the moisture and flavorings that can be lost during the roasting process, A typical brine has water, salt, a little sugar and the flavorings like herbs, fruits and aromatics. My secret ingredient is the vinegar, because the acidity is going to break down the meat to make it ultra tender and give you that melt-in-your-mouth texture! NOTE: Do not brine a self-basting or kosher bird, as this will make it way too salty. 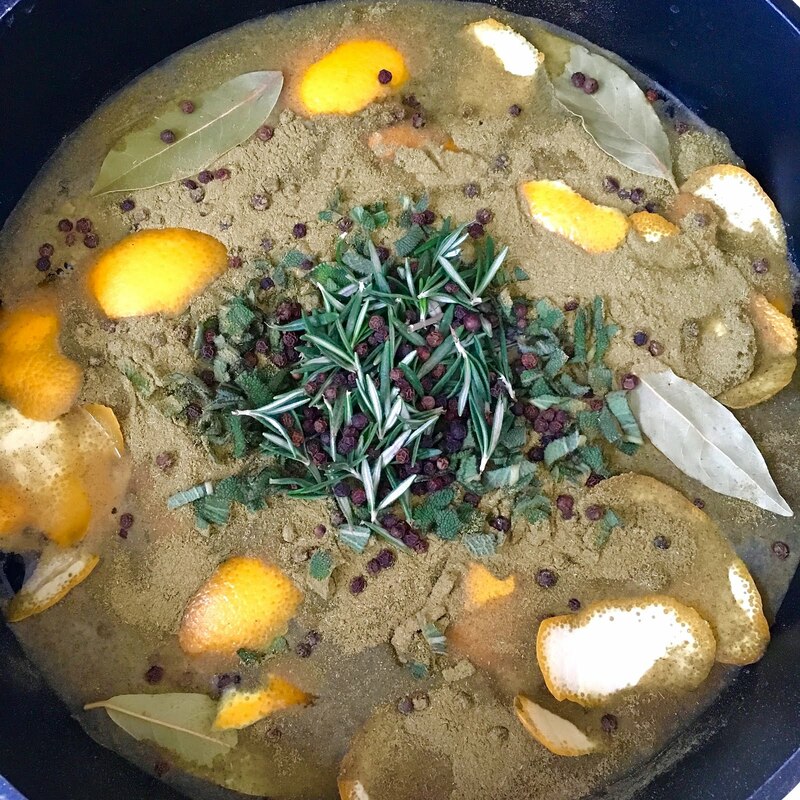 Start by adding salt and sugar, herbs, garlic and pepper to your simmering water. Stir until the sugar has completely dissolved and as soon as the brine boils, remove from heat. Then stir in the remaining water, vinegar and ice (that is what you see floating in the water. 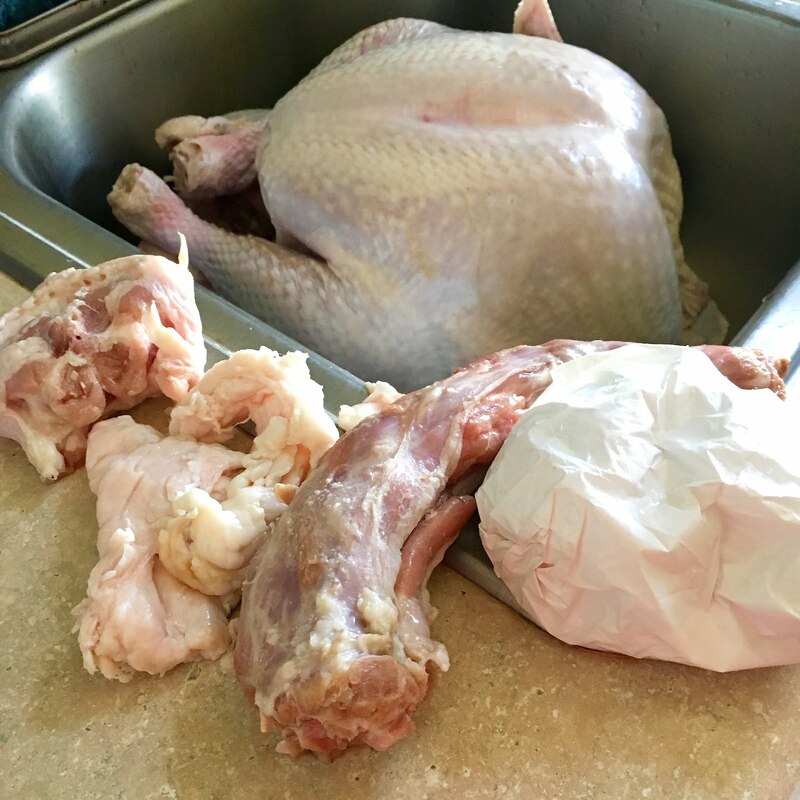 Rinse the outside and inside of your thawed turkey. Remove everything from the cavity. This is the neck. This is what you will find inside your store-bought bird, including that plastic package. Make sure you get everything out before brining and cooking! Put the turkey, breast side down, in a bag larger than the bird. 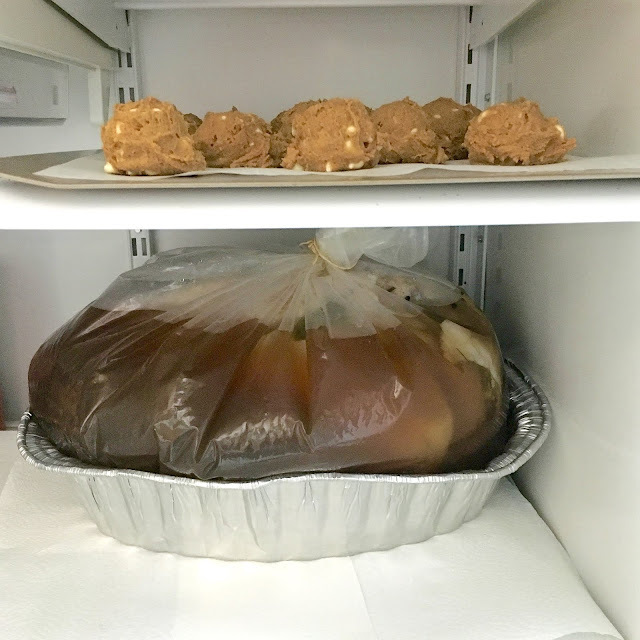 I have used "brining bags" and a turkey size "oven bags" in the past and both worked great- you can find them in the grocery store this time of year. Then, pour the brine in the bag with the turkey and seal it shut. 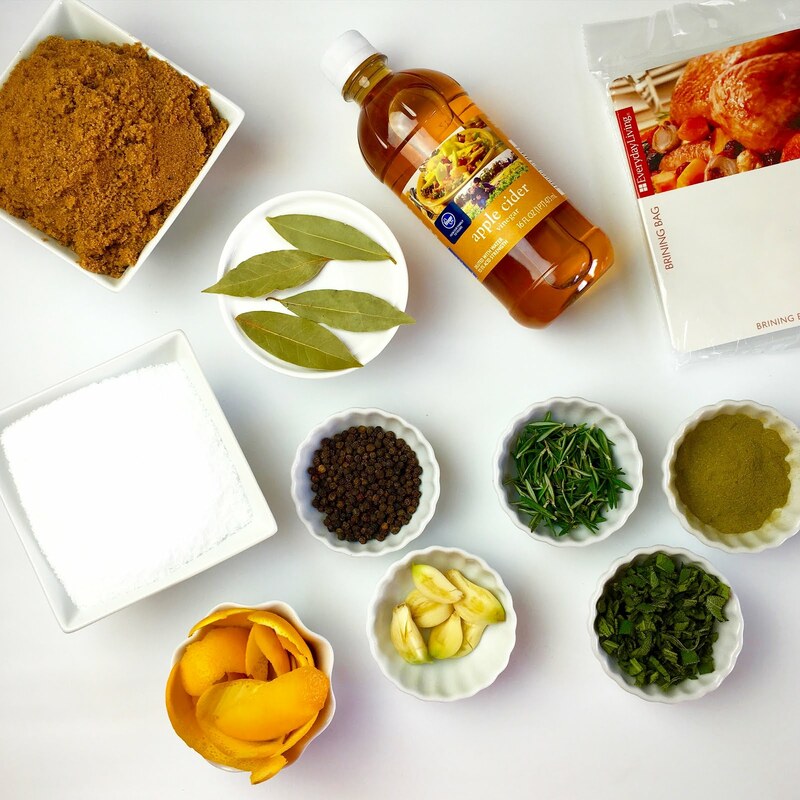 Let it sit in the fridge for one hour per pound of turkey to brine your bird. 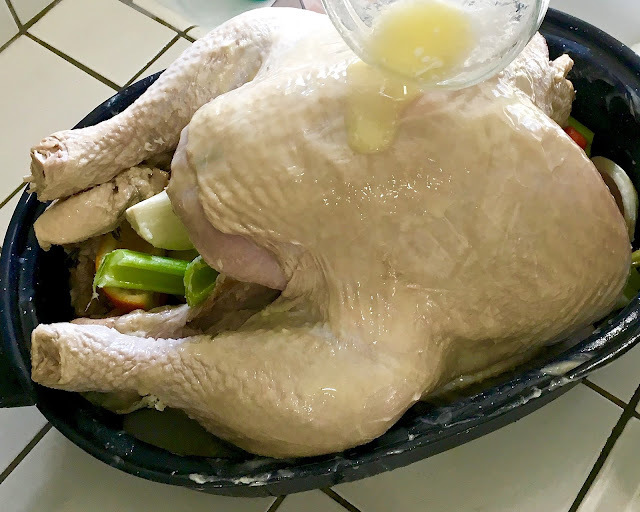 You can flip it over occasionally to let the top and bottom of the bird get soaked equally in the brine, if you want. Note: it will be very heavy at this point with the bring in the bag, so make sure you have someone to help bring it from the counter to the fridge... I learned the hard way. After brining, rinse the turkey, rinse it well so it is not too salty from the brine, and pat completely dry, so it is not cold out of the fridge when you put it in the oven so it cooks more evenly. Season the inside of the cavity with salt and stuff it with aromatics like an onion, garlic, orange peel, celery, carrot, rosemary sprigs, etc., NOT stuffing. (Make the stuffing separate). Tuck the wings underneath the bird and brush the skin of turkey all over with vegetable oil or melted butter, to ensure a perfectly browned and crispy skin. 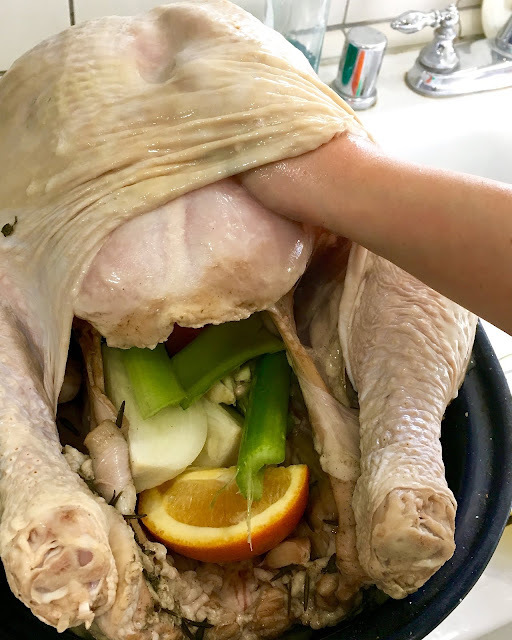 Then, use your hand to separate the skin from the bird, so we can stuff it with more good stuff! Season the skin of the turkey with salt pepper and rosemary, or any seasonings you choose, for extra flavor. I like to stick a few pads of butter under the skin and under the wings too. Then, you are all prepped and ready to cook your bird! I always roast mine in the oven. 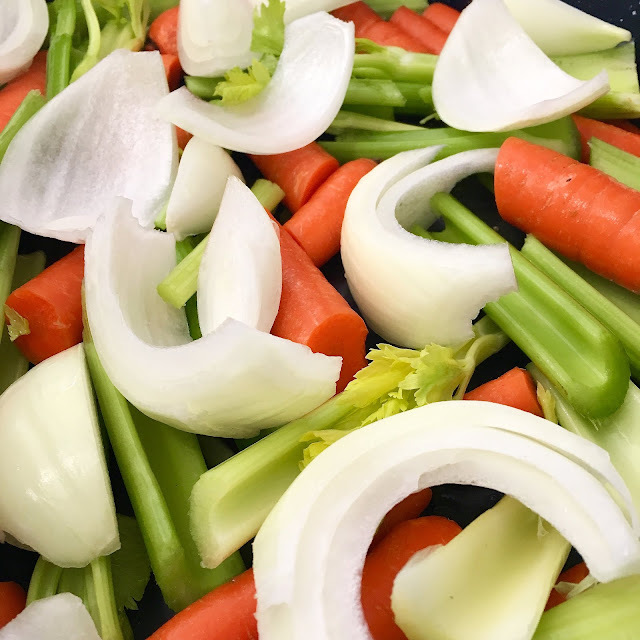 Place it breast-side up on the roasting rack in a pan, or my favorite way- on top of a layer of sliced onions, carrots and celery on the bottom of a roasting pan, this ensure it is not directly laying in the bottom of the pan, so the hot air can move around, and it flavors the drippings for the gravy! 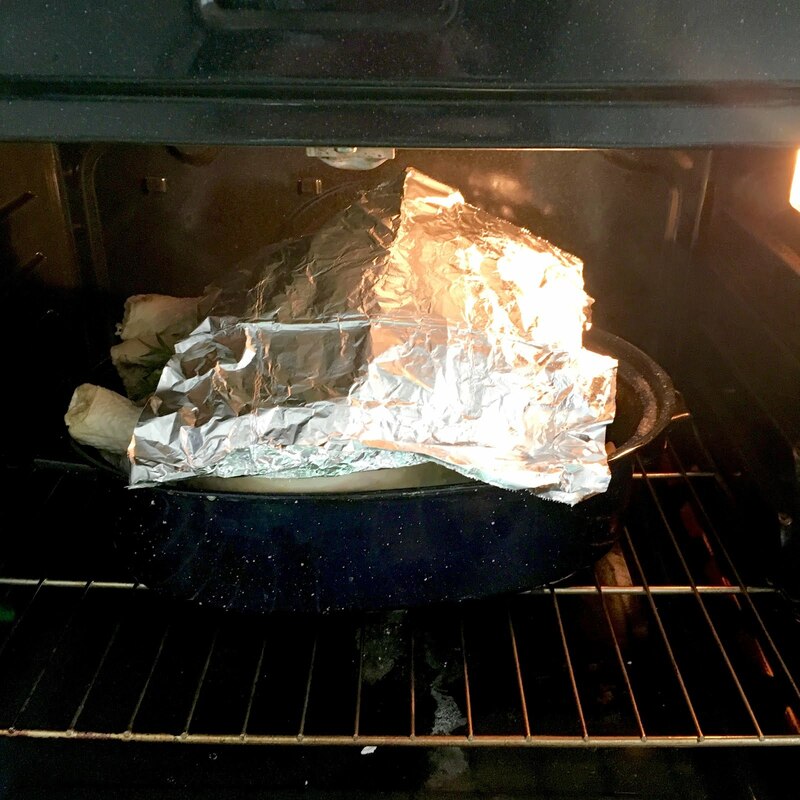 Cover the top with foil if it starts getting too dark. 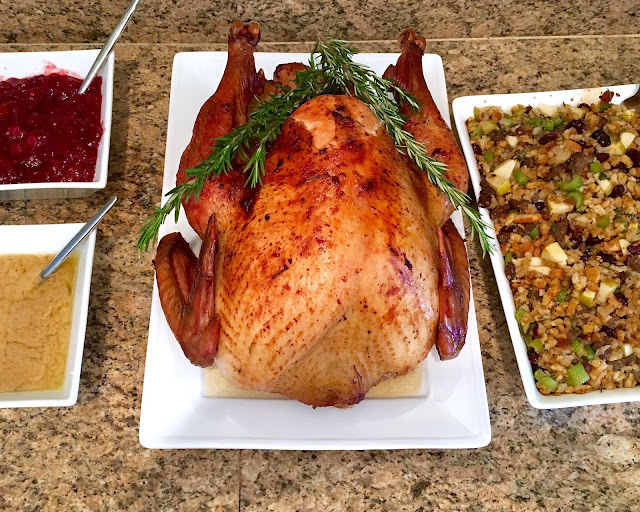 Voila, plump, juicy, tender and bursting with Thanksgiving flavor! 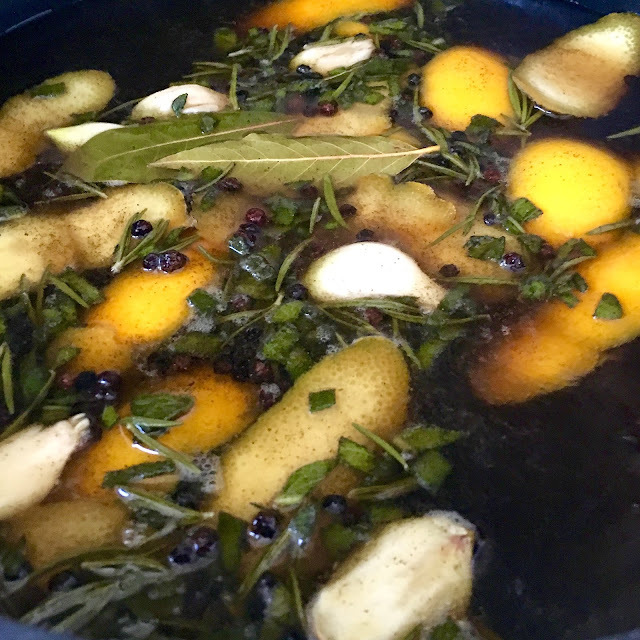 In a large pot, add half of the water, the salt, sugar, herbs, garlic, orange peel and peppercorns. Bring to a boil, stirring occasionally, until the sugar and salt have dissolved. Remove from heat and let cool to room temperature. Stir in remaining gallon of cold water and apple cider vinegar. 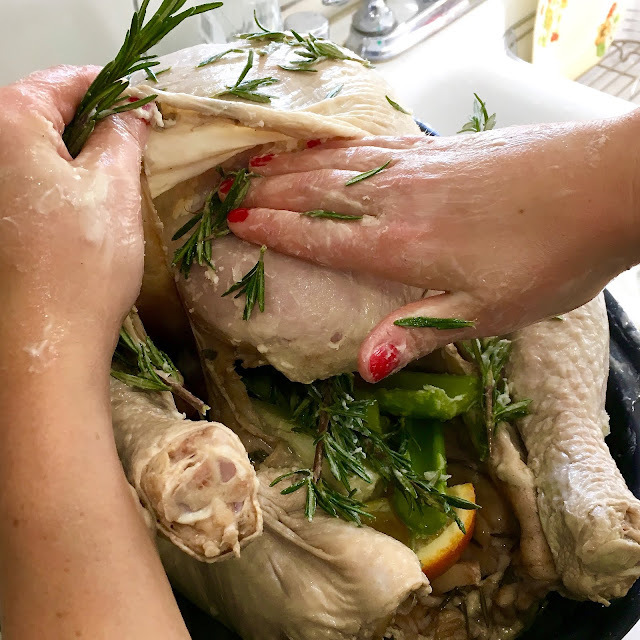 Rinse the outside and inside of a fresh or thawed turkey. Remove giblets and neck from the cavity. 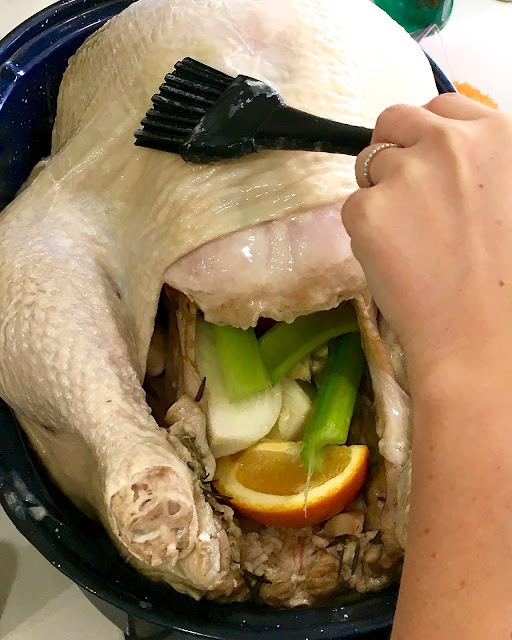 Completely submerge the turkey in a large pot or brining bag larger than the bird (I used a turkey size oven bag) and cover with a lid or seal/knot the bag, adding extra water if the bird is not fully submerged. 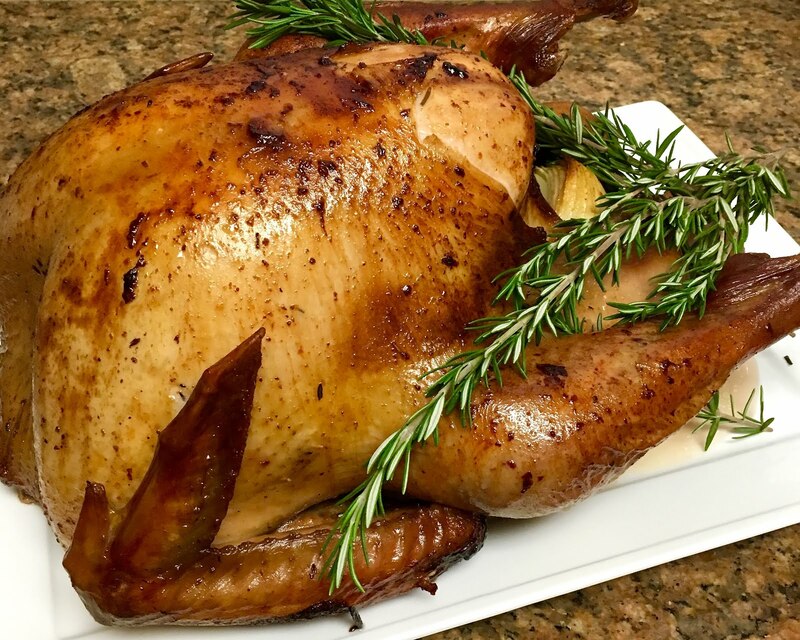 Let sit in the fridge for one hour per pound of turkey to brine your bird. 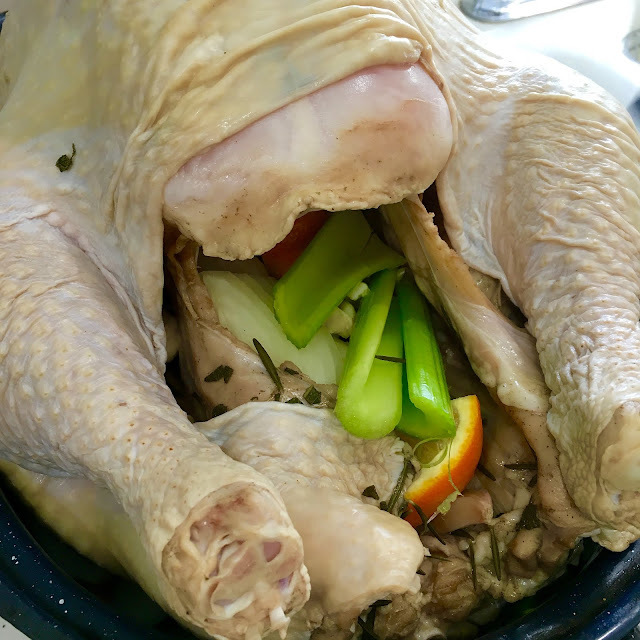 After brining, rinse turkey, (soak in water for about 15 minutes if you are using drippings for gravy so they are not too salty), and pat dry. Brush turkey with vegetable oil or melted butter and scoop some of the herbs and spices from brine solution and spread onto the skin of the turkey for extra flavor. Cook your bird as directed. 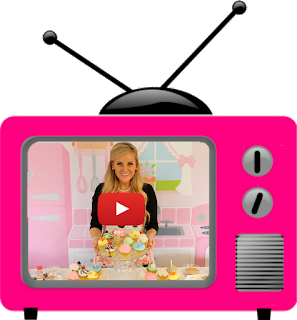 Click here for more Thanksgiving treats and recipes!